Post Op Day 6: Looking for attention Post Op Day 12: Sutures out!! HAPPY ONE WEEK AMPUVERSARY TIA!!! OMC!! You look absolutely ADORABLE in you high stylin fashion! Sooooo cute!!! Breat update and DELIGHTFUL photo! Awe sooo sweet. Beautiful kitty you have there. Tia’s rocking her new style! Outer space kitty! Sorry, I couldn’t help it. LOL, it does make her look a bit like an astronaut! Thanks everyone! Love that thing, so much better then trying to do the t-shirt ,onesie! Happy to hear she is feeling so much better! Hi! 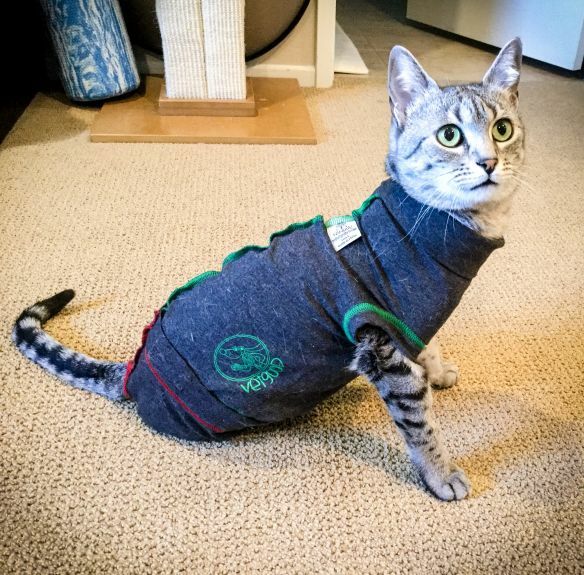 I asked my vet about the surgical suit and he wasn’t sure it would work for rear amputation cats. I told him about Tia wearing one and he said it would be fine if it worked but it was essential to keep Sami away from the wound. Before I buy one (I measured before his surgery and he is a LARGE), was it really beneficial and did it cover the wound area ok? How often did you rotate between the collar and the suit? It worked OK. She tended to get it dirty when using the litter box, so it was rotated with the cone for washings fairly frequently. It did keep her away from the stitches and she seemed more comfortable vs the cone. If one was a little more crafty than me, you might be able to sew up the extra fabric where the missing leg is, which might help keep it cleaner when using the box. Thank you! The vet will check out the suit on Wednesday when he removes drain tubes. I will be as “crafty” as necessary to get Sami out of that cone.